A Yellow Fever Vaccination Certificate is required for travel to some African and South American countries. 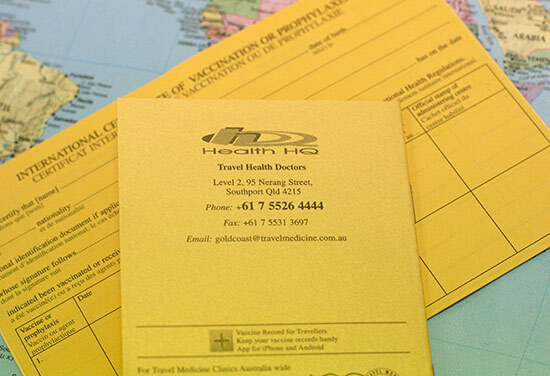 The Travel Health Doctors at Health HQ was the first clinic on the Gold Coast to become a government accredited yellow fever vaccination centre. We always carry a stock of the Yellow Fever vaccine which is kept in a temperature monitored refrigerator. Yellow Fever is an untreatable deadly disease occurring in parts of Africa and South America. If you will be travelling to or from a country infected with yellow fever, international health regulations require you carry an International Certificate of Vaccination, found in your vaccine record book, at the time of entry to that country. This is not only to protect you from getting this extremely deadly, untreatable disease, but also to prevent it from spreading around the world. The yellow fever vaccination and certificate are required for re-entry to Australia if you have visited a yellow fever country. For more information on the yellow fever disease and vaccination, visit our affiliated website www.yellowfever.com.au. Below is a map showing areas of risk for contracting Yellow Fever. Click on image below to see current Yellow Fever risk destinations on the CDC (U.S.) website. Health HQ has collected the following resources to help you with information regarding the risks of contracting Yellow Fever and information regarding the safety of Yellow Fever vaccine and injections which are also called immunisation, inoculation, shots or jabs. Click 'play' below to hear the Travel Health Doctor radio jingle now playing on selected radio stations across the Gold Coast! The Travel plan document is a PDF so you may need the Adobe reader.